Usually in stock but please allow an extra 1-2 weeks delivery time. SKU: N/A. 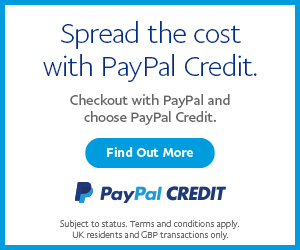 Categories: Camping Cooking, Kitchen & Stoves, Latest Products, Mercedes Sprinter Interior Upgrades, Refrigeration, Self Build Refrigeration, VW Amarok, VW LT Parts, VW T2 Parts, VW T4 Parts, VW T5 & T6 Parts. Compact SnoMaster fridges and freezers in hard-wearing plastic housing. Best cooling performance thanks to our one-of-a-kind compressor. Can be used as a refrigerator or freezer down to -22°C. For 12 and 24 Volt DC as well as model-dependent 100 to 240 Volt AC. 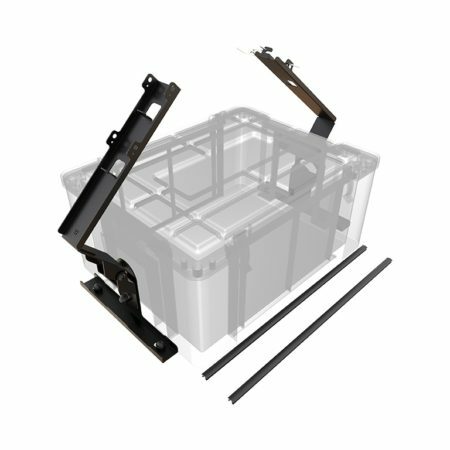 SnoMaster also offers ultra-compact and high-performance fridges for use in the vehicle cabin or trunk, that correspond perfectly to the coolers and freezers of the Leisure Series. Due to their shoulder straps and light weight, they are easy to carry which makes them a perfect companion for barbecues or shopping, among many other things. As a second cooler in the vehicle, they are the perfect solution for providing cool drinks or snacks while on your way. As a freezer it is perfect for storing frozen food during a trip and thus the ideal addition to a large stationary refrigerator. The SMDZ-LS12 makes the perfect, smaller cooler to keep snacks and drinks cool while you’re on your way. As a freezer with temperatures down to -12°C, it is suitable for storage of frozen food during a trip and thus the ideal alternative to a larger fridge. The SMDZ-LS35 is the ideal, compact fridge and freezer with the cooling capacity of the large SnoMaster fridge that goes down to -22°C but takes up less space. The outer, dark-gray cover is made of durable plastic. The cooling compartment, divided by a partition wall, depending on the model, is dark-gray and white or are made of steel for quicker cooling capabilities. The lid provided has a stable hinge, which functions reliably even after many years of use. Anyone who forgets to close the lid of the cooler, is reminded by an alarm tone after 90 seconds. Integrated LED lighting helps when searching for your food after sundown. The temperature is adjusted by means of an intuitively operated panel with large and bright illuminated LED displays with direct temperature selection in degrees Celsius. Both models can be powered by 12 or 24 Volt DC at the cigarette lighter socket or DIN standard socket of a car or truck, the SMDZ-LS35 also with 100 to 240 Volt alternating current at almost every outlet worldwide. To prevent a deep discharge of the supply battery, all fridges are equipped with a battery monitor. This can be set via the control panel in three stages. When the voltage is too low, the cooler switches itself off. As soon as sufficient battery voltage is available again, the cooler automatically restarts. The fridge can also be used to charge mobile phones or other devices via a front USB port. The large model is equipped with the same SnoMaster’s own high-performance compressor, as is also used in the Expedition Series’s top models. The SMDZ-LS12 has a special, very compact compressor from Secop. The outer cover is made of dark-gray, durable plastic. The lid comes with fixed hinges that function reliably after many years of use. With the shoulder strap the cooler can be easily carried. The insulating layer of polyurethane insulation foam is 25 mm thick. This results in good storage capacity in the case of extreme outside temperatures if the box is disconnected from the power supply and/or has low power connection while operating. For mounting inside the vehicle, the SMDZ-LS12 is delivered with a black powder-coated steel mounting plate, as standard. The cooler can be fastened to this with a tension belt. The partition wall in the refrigerating compartment is dark-gray and white. The smaller compartment is ideal for chocolate or other small, individually packaged sweets. The walls of the large compartment are made of powder-coated, grained steel. Still has a higher temperature conductivity compared to plastic, so the interior cools much faster. For hygienic and practical reasons, there are no cooling coils or plates installed and there are no angled corners and brackets for inserts or separating plates. This makes cleaning much easier. No dirt can hide in corners or behind metal sheets. 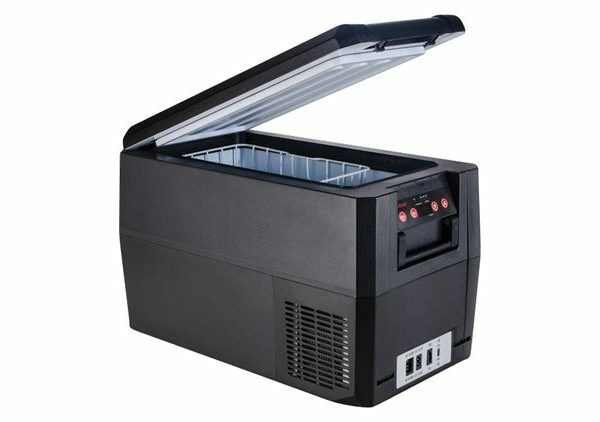 The cooling compartment has a power-saving LED light which automatically turns on when the lid is opened. An alarm tone will sound after 90 seconds to remind you that the door may have accidentally been left open. The temperature for the cooler can be set between 10° and -12°C. The unit can thus be used as a cooler or as a freezer, as required. With a minimum temperature of -12°C, this corresponds to two-star labeling and is thus suitable for medium-term storage of frozen food for up to three weeks. Perfect for a holiday! The digital LED display shows the current indoor temperature. The desired temperature can be adjusted in 1°C increments. The extra-bright red LED displays with large digits are easy to read in sunlight. The coolers can be operated on 12 or 24 Volt DC at the cigarette lighter socket or the DIN standard socket of a car or truck. If the power switches off while the fridge is in the ‘’switched-on’’ state, the fridge automatically switches on again as soon as power is available. In addition to the plug-in contact for the power cable, an external easily-accessible 15 Amps automotive anti-theft device has been installed. Both the temperature control and the compressor are equipped with a polarity reversal switch so that faulty wiring will not damage the SnoMaster fridge. To prevent draining your battery supply, all fridges are equipped with a battery monitor. This can be adjusted via the control panel in three steps between 10.0, 10.7 or 11.8 Volt or 22.2, 23.5 or 25.0 Volt. When the voltage supply is too low, the fridge turns itself off. This prevents draining the battery which can cause damage both to the car and fridge. As soon as sufficient battery voltage is available, the fridge restarts automatically. Depending on the setting, this is 11.4, 12.0 or 12.9 Volt or 23.4, 24.8 or 26.3 Volt. The cooler is also equipped to charge mobile phones or other devices via a front USB port. A compact compressor from Secop (formerly Danfoss) is used for the SMDZ-LS12 model coolers. The PBC-1.4 offers high efficiency with low power consumption and quiet operation. The power is about 25 Watt. The compressor is designed for an ambient temperature of up to 55°C. As with the large fridges of the Classic and Expedition Series, the SMDZ-LS12 also incorporates highly effective plate evaporators. These offer higher efficiency than conventional grid evaporators at higher ambient temperatures, as often occur in vehicles. A dirty condenser (evaporator) reduces the cooling capacity considerably and increases the power consumption. To clean it, it can easily be air-blown with compressed air through the ventilation grills. SnoMaster fridges are equipped with an integrated diagnostic system, which outputs error messages on the temperature display if there is a problem. OC: Temperature sensor provides no values (permanently or temporarily). Check connections and restore, if necessary. SC: Temperature sensor is defective. Repair is necessary. HH: Temperature controller is defective or valve blocked in the open position. Repair is necessary. 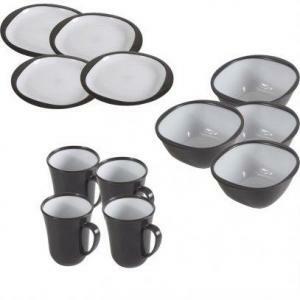 The outer cover is made of durable dark-gray plastic with solid carrying handles. The cooler has a stable hinged lid, which will function reliably even after many years of use. The insulating layer of polyurethane insulation foam is 45 mm thick. 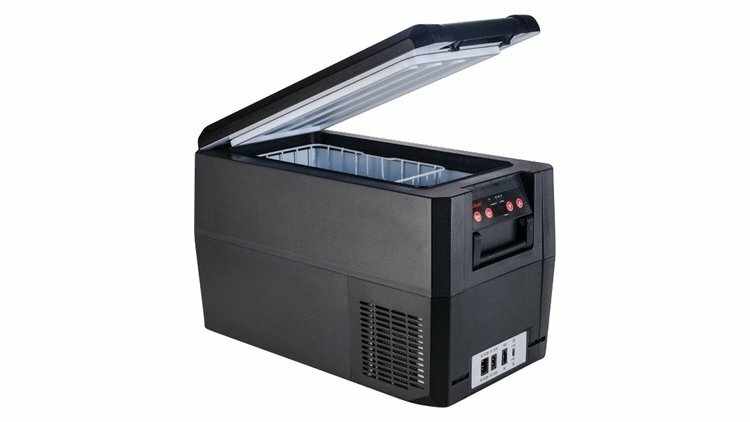 A very good value for a compact cooler. This results in a good cold storability even in the case of high outside temperatures, if the box is disconnected from the power supply and/or when there is low power consumption during operation. The white side walls of the large compartment are made of powder-coated, grained steel. Due to the higher temperature conductivity compared to plastic, the interior is therefore cooled down much faster. The floor is made of plastic. The side walls, which are rounded slightly upwards, prevent condensation on the floor from entering the insulation layer of the box. For hygienic and practical reasons, there are no cooling coils or plates installed, and there arealso no angled corners and brackets for inserts or separating plates. This makes cleaning easier. No dirt can be hidden in corners or behind metal sheets and nothing can rust. For even easier cleaning, each cooling compartment has a closable drain opening. This is also very useful when defrosting. Simply pull out the plug and drain the water. The SMDZ-LS35 comes with a removable plastic-coated metal cradle. This comes with a removable separation grid. If you forget to close one of the flip covers, an alarm tone will sound after 90 seconds. The desired temperature can be adjusted for the freezer according to your own wishes between 10° and -22°C. The compartment can be used as a cooler or freezer compartment, as required. A digital LED display shows the current indoor temperature. The desired temperature can be adjusted in 1°C increments. The extra-bright red LED displays with large digits are even easy to read in sunlight. For maximum flexibility, the coolers can be operated with 12 or 24 Volt DC at the cigarette lighter socket or the DIN standard socket of a car or truck, as well as with 100 to 240 Volt alternating current at almost every outlet worldwide. DC and AC cables can be connected at the same time. As soon as alternating current is available again, the cooler runs with alternating current. If the power supply is lost while the fridge is running in the ‘’switched on’’ state, the fridge automatically switches on again as soon as power is available. The maximum power consumption of the compressor is only about 5 Amps with the highest cooling capacity. Operation is thus possible, without problems, through the cigarette lighter socket. In addition to the two plug-in contacts for the power cables, an externally easily-accessible 15 Amps automotive anti-theft device has been installed. Both the temperature control and the compressor are equipped with a polarity reversal protection so that faulty wiring will not damage the SnoMaster cooler. The necessary connection cables are included in the delivery. No external power supply is required for 230 Volt operation. The screwed cigarette lighter plug can be removed for a fixed cabling. When operating with a cigarette lighter or a car socket, this should be designed for at least 120 Watt (10 Amps at 12 Volt, 5 Amps at 24 Volt). If you use your own connection cables, these should have a dimension of 2×2 mm². To prevent a deep discharge of the supply battery, all fridges are equipped with a battery monitor. This can be set via the control panel in three stages between 10.0, 10.7 or 11.8 Volt or 22.2, 23.5 or 25.0 Volt. When the voltage is too low, the cooler switches itself off. This prevents damage to the battery due to deep discharge. If the cooler is connected to the starter battery, it also prevents the vehicle from starting due to a discharging battery. As soon as sufficient battery voltage is available, the fridge automatically restarts. Depending on the setting, this is 11.4, 12.0 or 12.9 Volt or 23.4, 24.8 or 26.3 Volt. The cooler can also be used to charge mobile phones or other devices via a front USB port. The SMDZ-LS35 is equipped with the same SnoMaster high-performance compressor, as in the top models of the Expedition Series. SnoMaster created it to ensure the best cooling performance for transportable fridges and freezers. Even in the harsh environment of an off-road vehicle and at extreme temperatures like the desert, reliable operation is ensured. The compressor is designed to withstand dust and dirt, violent vibrations, as well as driving up and down steep hills. SnoMaster grants a 5 year warranty on the compressor. In order to optimize power consumption and cooling performance, the compressor speed is automatically controlled in three stages. In order to limit the starting current, the compressor always starts at a slow speed and only increases the speed after about a minute. There is no difference in the automatic power control whether the cooler is operating on direct or alternating current. Even when operating at 12 Volt in the vehicle, the compressor provides the full cooling capacity. The compressor is designed for an ambient temperature of up to 55°C and is protected from overheating. When reaching 90°C the compressor switches off for protection until the temperature drops back down to 75°C. In the temperature range between 75°C and 90°C, the compressor runs at low speed. The SnoMaster compressor has a 20% higher performance than Danfoss’s BD35F, which is often installed and advertised on other brands, and is slightly above the larger BD50F. A more powerful compressor usually allows a higher cooling efficiency in the 24-hour cycle, resulting in a low power requirement. Interesting to note, SnoMaster also produces technically simpler fridges for warehouses and has installed the Danfoss compressor in these. The SnoMaster’s own compressor is only used with the high-quality fridges sold under its own brand name. A dirty condenser (evaporator) significantly reduces the cooling capacity and increases the power consumption. For cleaning it can be air blown very easily with compressed air by means of the generously spaced ventilation grills. SnoMaster coolers are equipped with an integrated diagnostic system, which outputs error messages on the temperature display. 1 Compartment. 12 Liters. Portable. Down to -12°C. 12 / 24 Volt. Outer dimensions (L/W/H): 505 x 190 x 385 mm. It is 480 mm without the carrying strap and power plug. 1 Compartment. 35 Liters. Portable. SnoMaster High Performance Compressor. Down to -22°C. 12 / 24 / 100-240 Volt.